We renovated our home last summer and our backyard suffered some serious neglect and abuse. Not only did we stop weeding in the couple months before we moved out, but our yard was untouched all summer (that is, the parts that weren’t trampled by construction workers and their equipment). We didn’t do any outdoor work in the autumn either because we moved in pretty much as the leaves were dropping and were so overwhelmed with everything going on in INSIDE that we couldn’t even consider doing anything OUTSIDE. 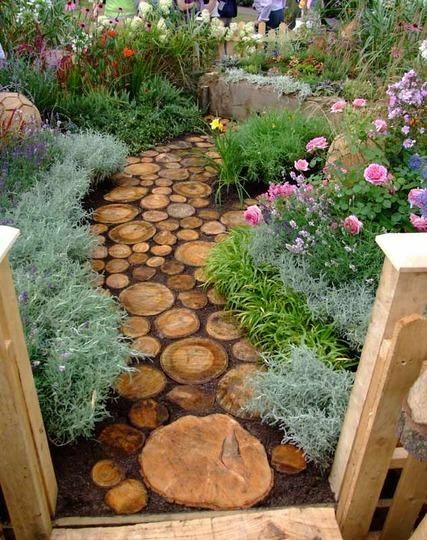 First on our list is to find a way to create a very inexpensive garden path. 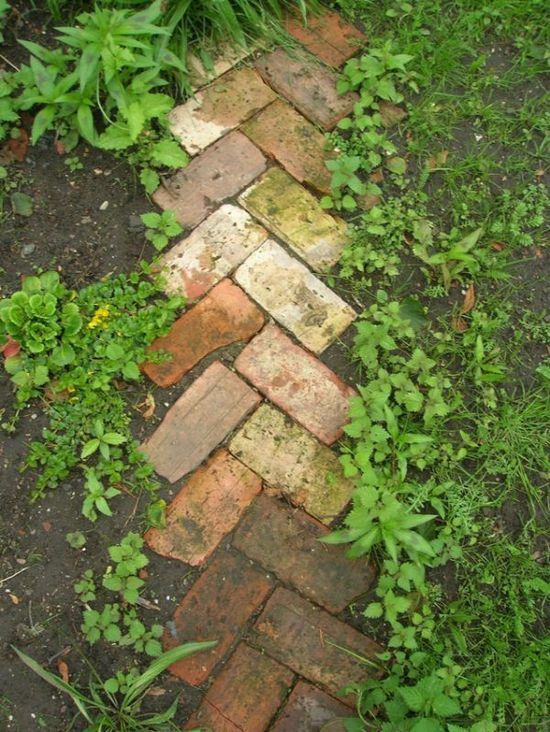 I’ve already found a couple of listings for very inexpensive brick pavers on UsedOttawa (yay!) and I am willing to put in the sweat equity to build something cool. Now to find a design! The old weathered brick could add a lot of visual interest to a wild space in our garden. Here’s another example that caught my eye, laid out a little differently. Or we could choose to go with wood instead of brick pavers. 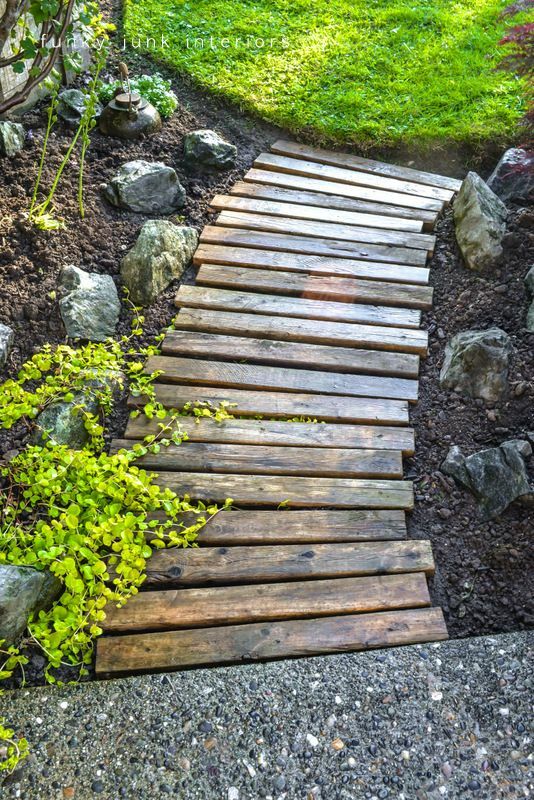 Pallets come cheap on UsedOttawa too, and can be used to create something informal and interesting. The wood might not last more than a couple of years, but as long as we had a chainsaw we could always create spares, right? Whatever we decide, I am steeling myself for some hard labour. But hey, I figure it’s worth it, given the amount of time we’ll be spending in our backyard this year. Find lawnmowers on your local Used.ca site here. Find gardening supplies on your local Used.ca site here. Find building supplies on your local Used.ca site here. Read more of our great gardening blogs here. The cedar looks fantastic in your photo and it does for a while but will turn black/dark in no time. And you have to make deep 5″ chunks so that it does not break in pieces (cedar is kind of fragile). The red bricks look really good but keep in mind that you have to dig up the space where you want to lay them (6″ hole) and fill it iwth stone dust and sand, then tamp it down. You do this so that it stays nice and flat and does not heave in the winter. Note also that small bricks means lots of cracks between the bricks. And weeds grow in these cracks. Year one is not bad. And then, the weeds are relentless. But it is nice when it’s well maintained. If you like pulling lots of little weeds, it’s great. The pine boards also works (even better with cedar) but you need to attach them to base planks so the boards don’t move. Build the sections with small ½” spaces between the boards and put a sheet of black gardening cloth underneath. No weeds. And you can get away with just a bit of sand underneath (as opposed to digging and buying lots of stone dust). This is for a large patio? 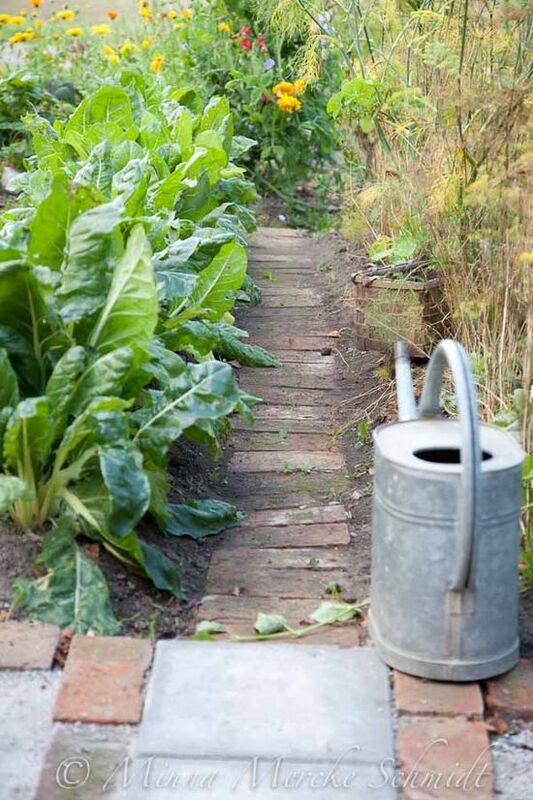 Or just paths in your garden? Go for it. A great summer project. Hi there, I’m thinking of using redwood rounds as “tiles” in an area with a hammock hung between 5 redwoods. I’d love opinions as to how this would/would not work, be accomplished..or shall I forget it and go with pea gravel? Honestly, I think this would look absolutely amazing and the rest of our marketing team do too. We’d love to see what you d. Feel free to send images to Amber@UsedEverywhere.com! If you want a more formal look without the full on effort of cementing the bricks in place, you can make up a mix of sand and cement, put in in the cracks and then water gently with a hose. The cement will “go off” and you’ll end up with a hard gap filler that will help keep the weeds out. Cheap and long lasting, low maintenance path? : Screenings (crushed rock ,basically) for the path, rebar and pressure treated ties– to make steps. All you need is a drill and bit to put holes in your ties for the rebar – and a level. to check that the steps are level. That is it!! lasts, safe, looks fine. The architecture is amazing. Such creativity put into these pathways. Thank you for sharing! What a beautiful set of pathways! It seems mind blowing. This is really going to be helpful. Thanks for sharing.